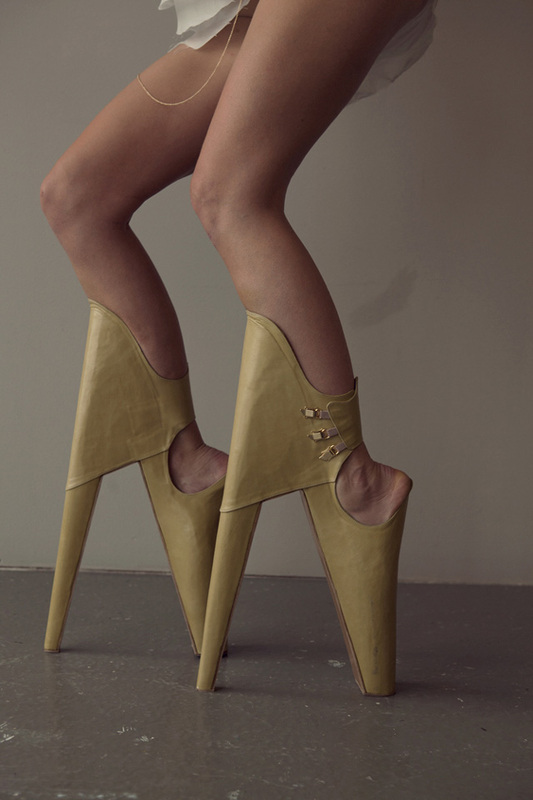 Artist Leanie van der Vyver, in collaboration with dutch shoe designer René van den Berg, created Scary Beautiful, a concept pair of super-tall leather shoes where the ‘high heel’ is in the front. To wear them the user must place their weight on a piece that holds their shins. Filmmaker Lyall Coburn created a short film titled Scary Beautiful that shows a woman slowly walking in the shoes. Humans are playing God by physically and metaphorically perfecting themselves. Beauty is currently at an all time climax, allowing this project to explore what lies beyond perfection. Scary Beautiful challenges current beauty ideals by inflicting an unexpected new beauty standard.